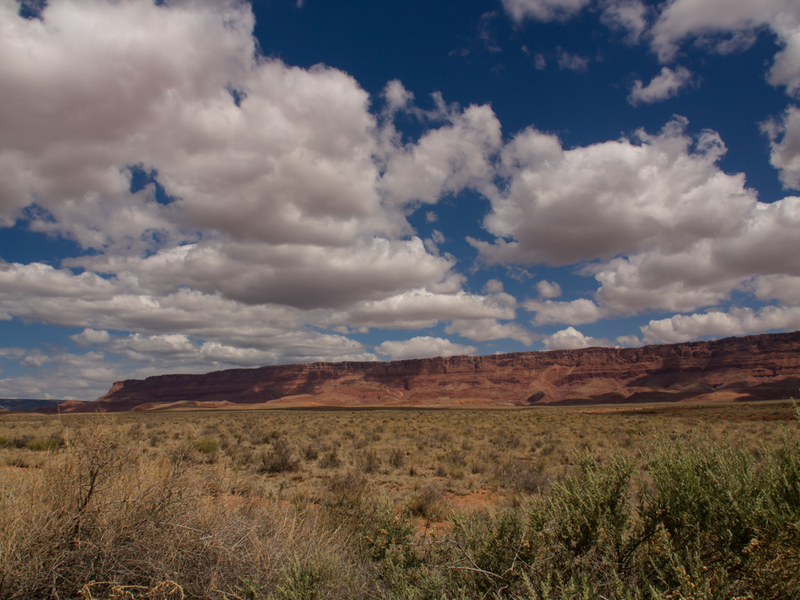 We left Marble Canyon and made our way north on the dirt to Vermillion Cliffs. 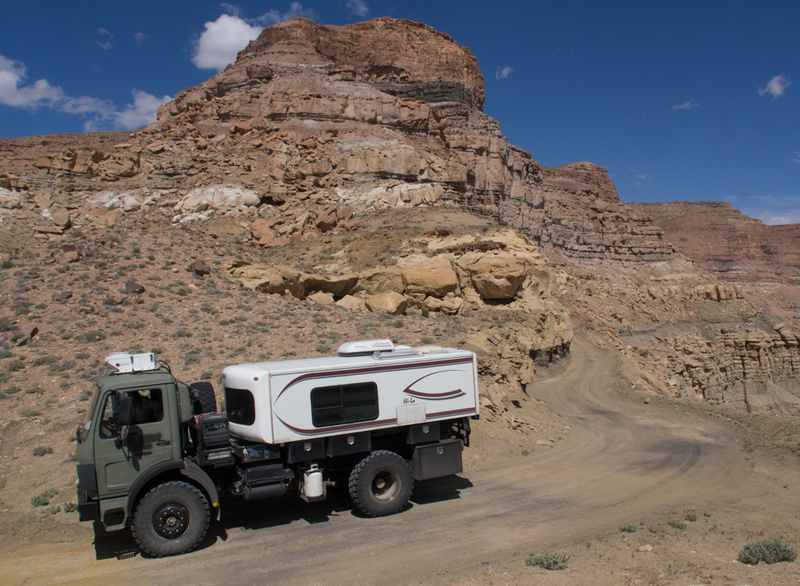 We traveled north through the Vermillion Cliffs wilderness area and then hit US89A and went east to Big Water, UT for a fuel stop. 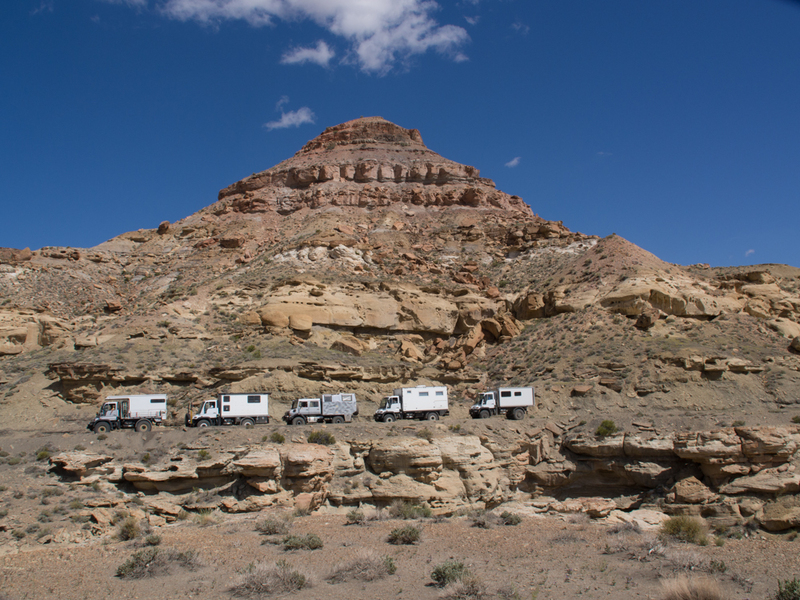 From Big Water, we headed north into the Grand Staircase National Monument. The photos below are what we saw. 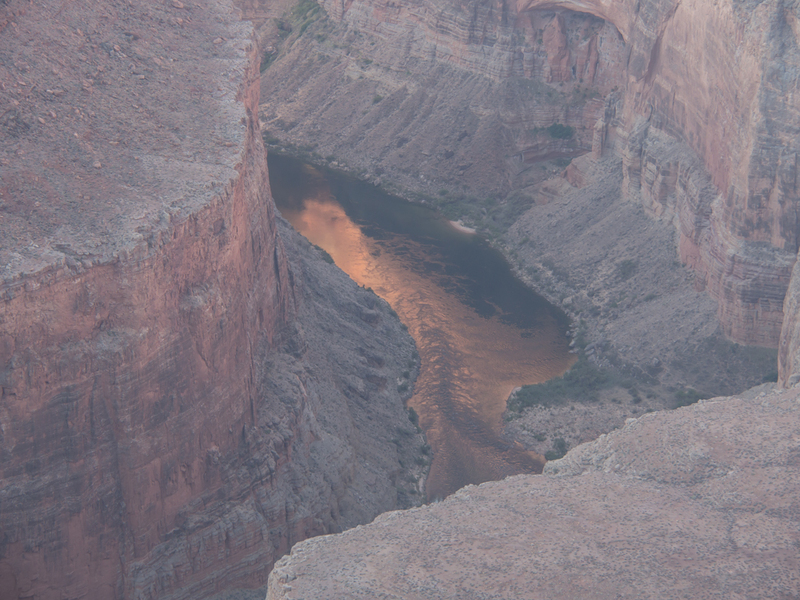 Just after sunrise at Marble Canyon, we could see into the depths of the gorge. 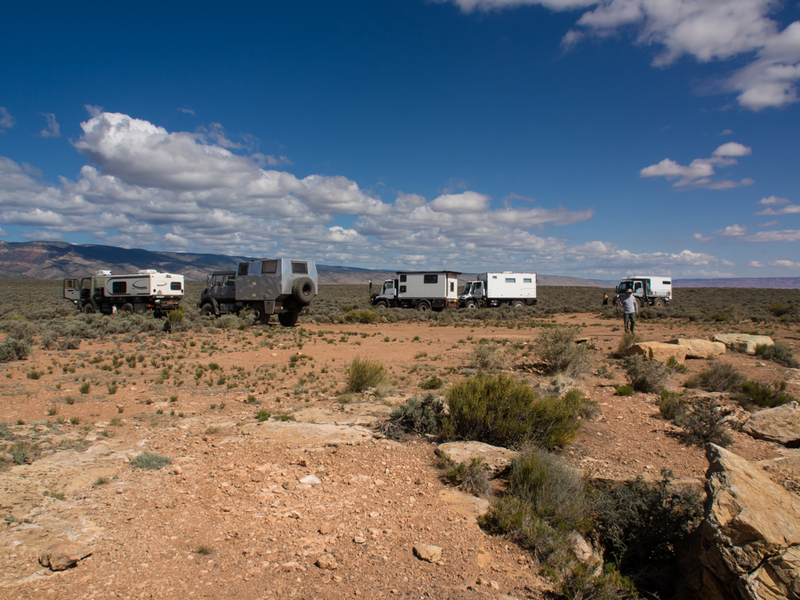 Our camp site was barren and had no trees. But, what it lacked in trees, it more than made up for in awesome views. 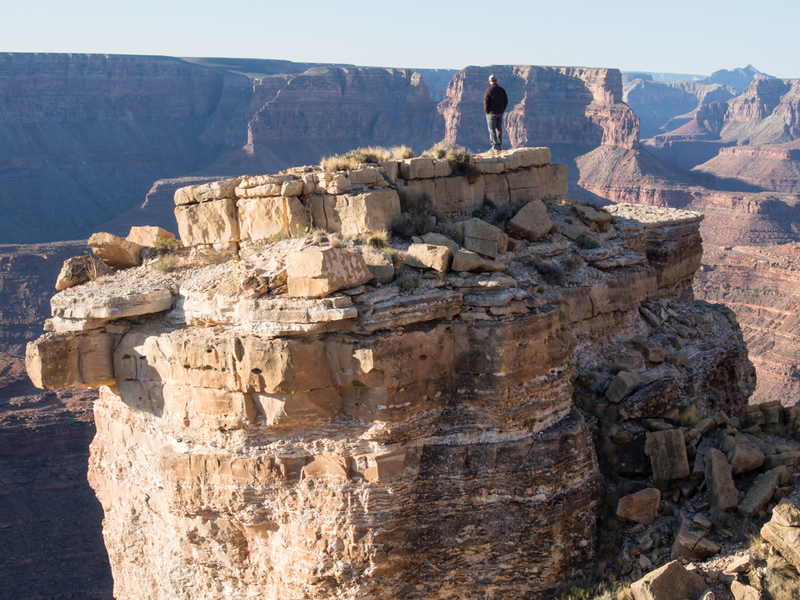 Just after sunrise, Rob went out to one of the pinnacles to get a better view of the canyon. Looking south from our camp we could see the Colorado River. 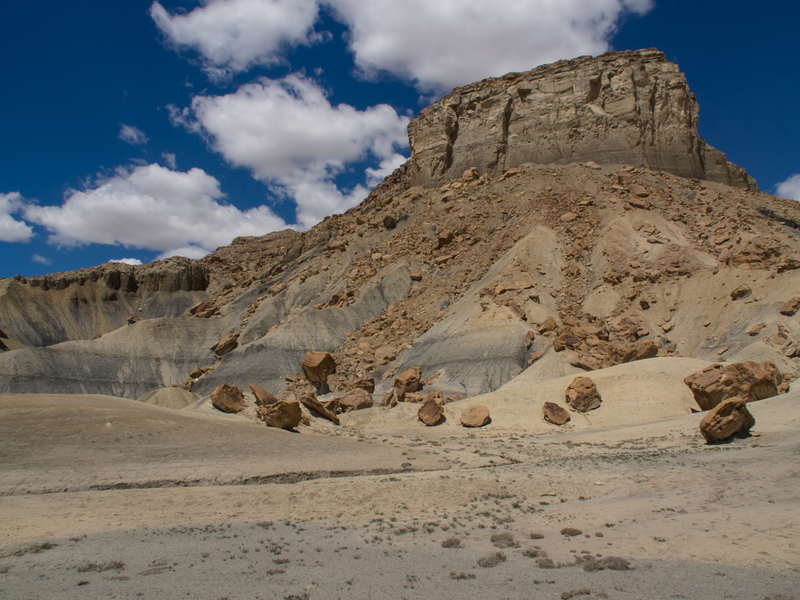 Every side canyon produced a rapids due to debris washed down during rains. 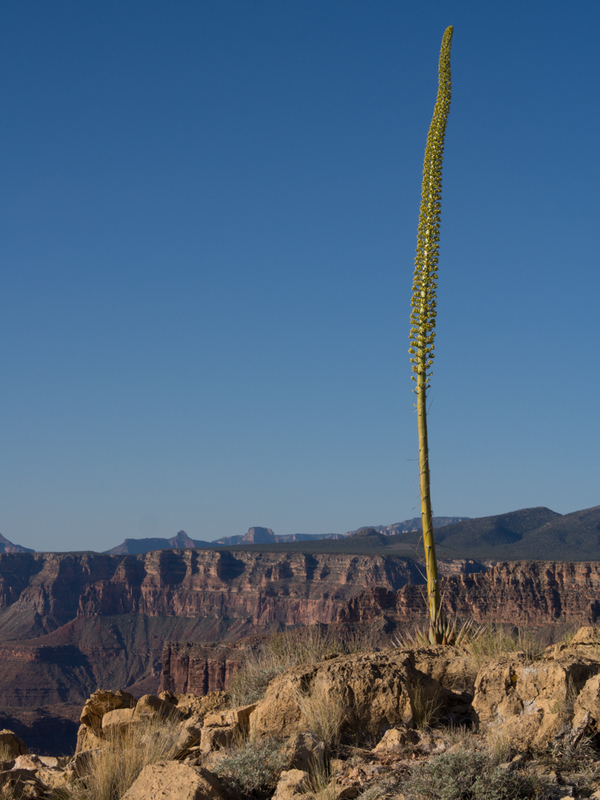 The upper plateau was pretty much devoid of interesting trees, save this yucca cactus preparing to bloom. We broke camp and headed toward another lookout point. 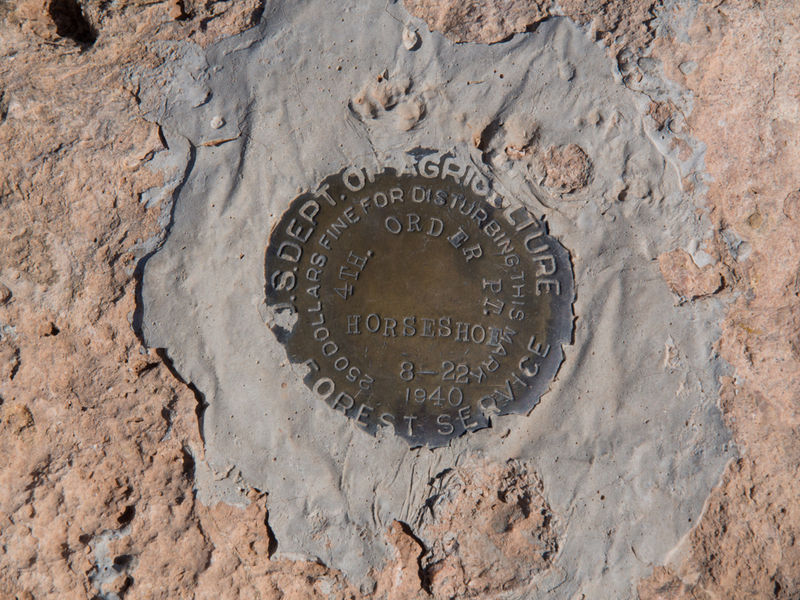 No elevation on this benchmark, only the date, a name and a location-quality indicator (fourth order). 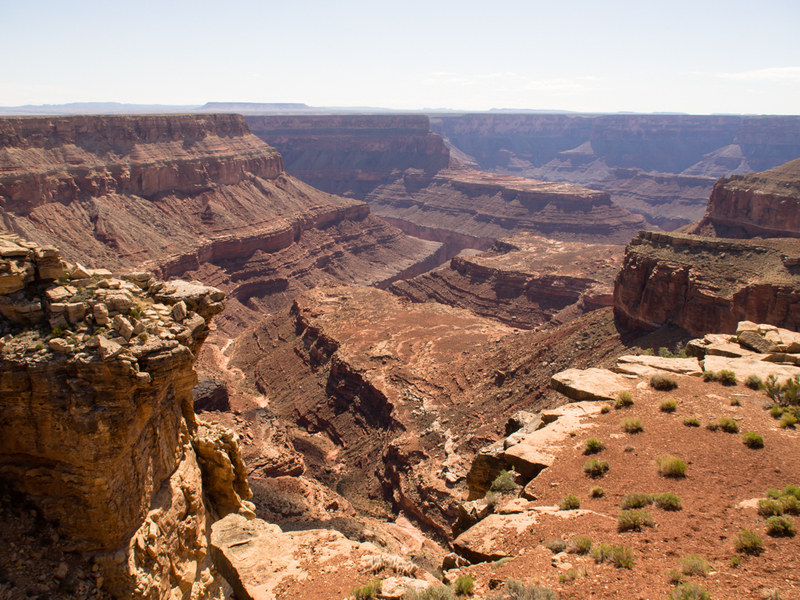 The side canyon visible from the viewpoint was awesome. 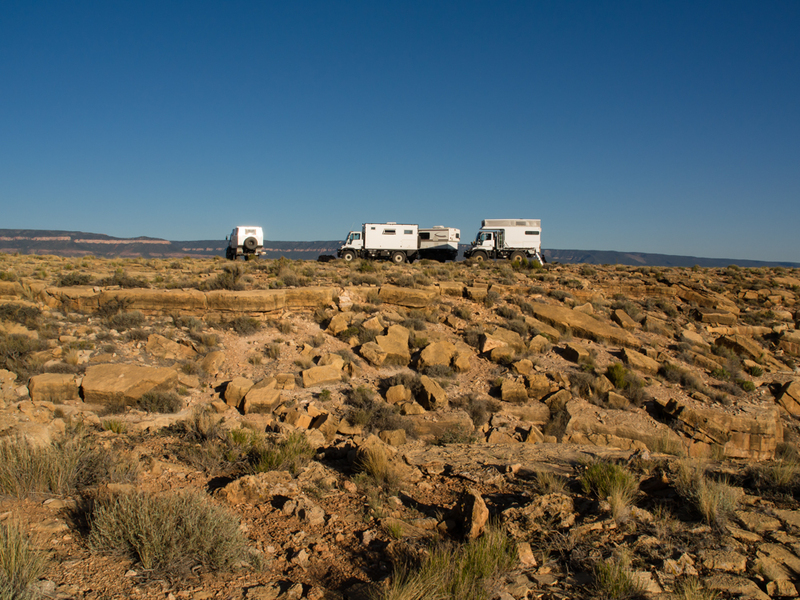 Once everybody got their photos, we loaded up for the 30 miles to US89 and Vermillion Cliffs. 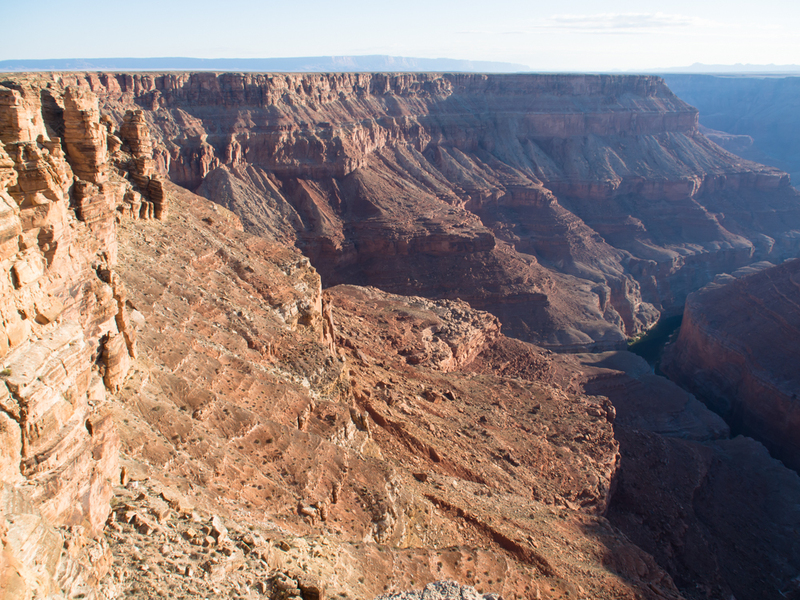 On the exit from the area, we got a good view of the Kaibab monocline that forms the north rim of the Grand Canyon. 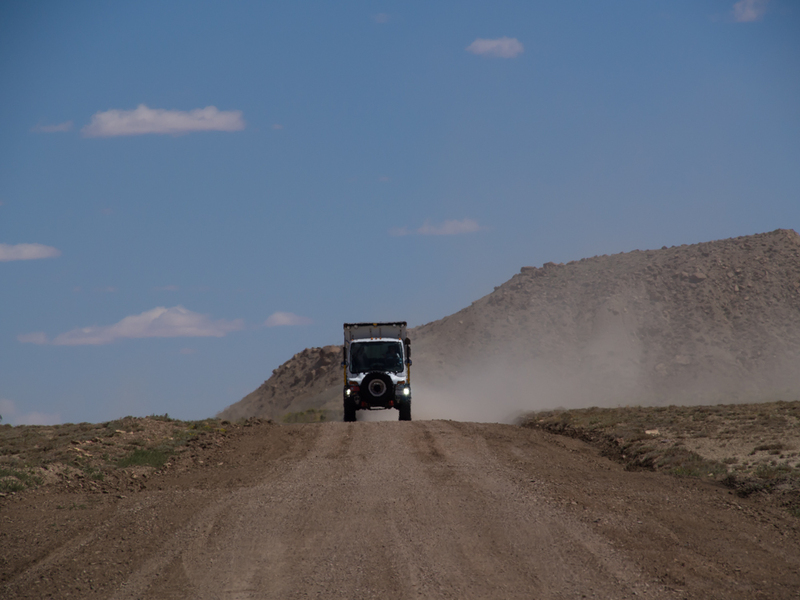 Thor led the path back to the highway and from the turnoff we got a view of the other trucks approaching. 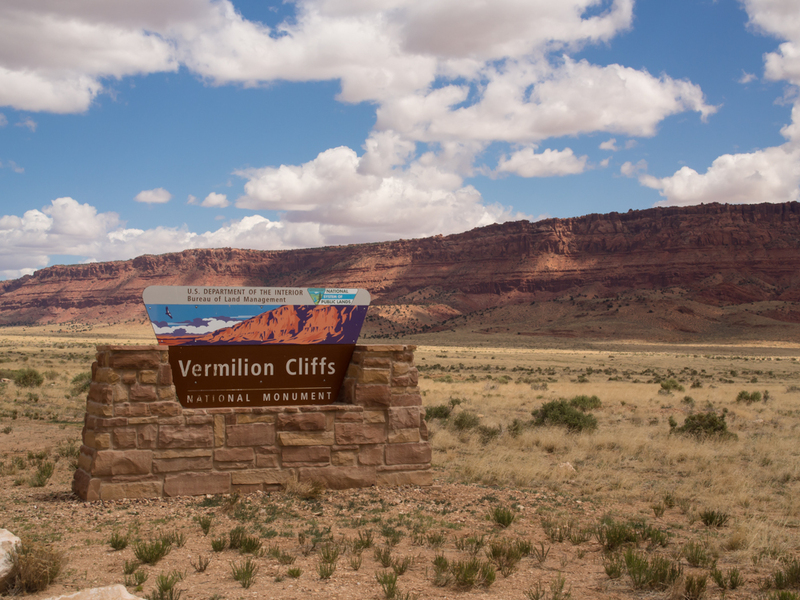 The Vermillion Cliffs are worthy of their name and are many, many miles of brilliant, deep-hued walls glowing in the bright sunlight. 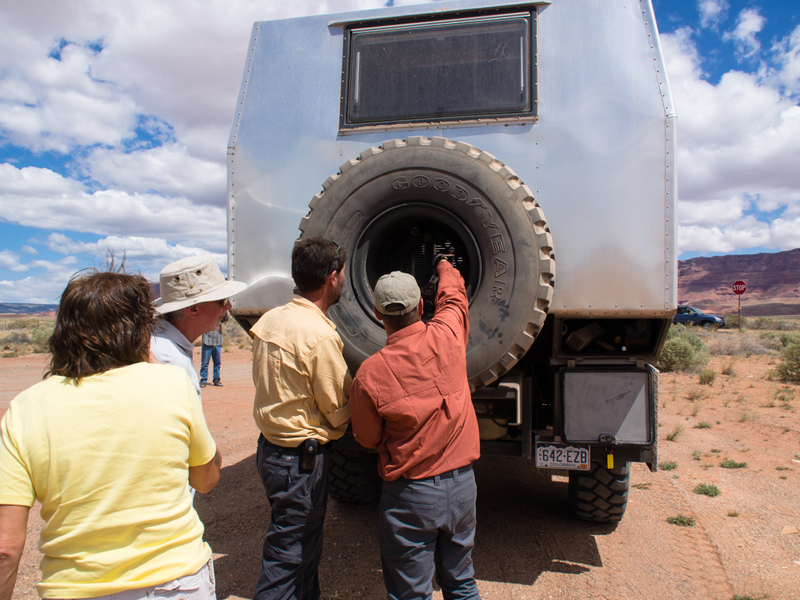 Rob's 2450 camper was "custom made" by some German fellow but he did not think through the tire mount frame. Rob had to repeatedly tighten the nuts that hold the wheel in place. An easy fix with a welder and some 2x2 inch steel tube, and we did not have either. 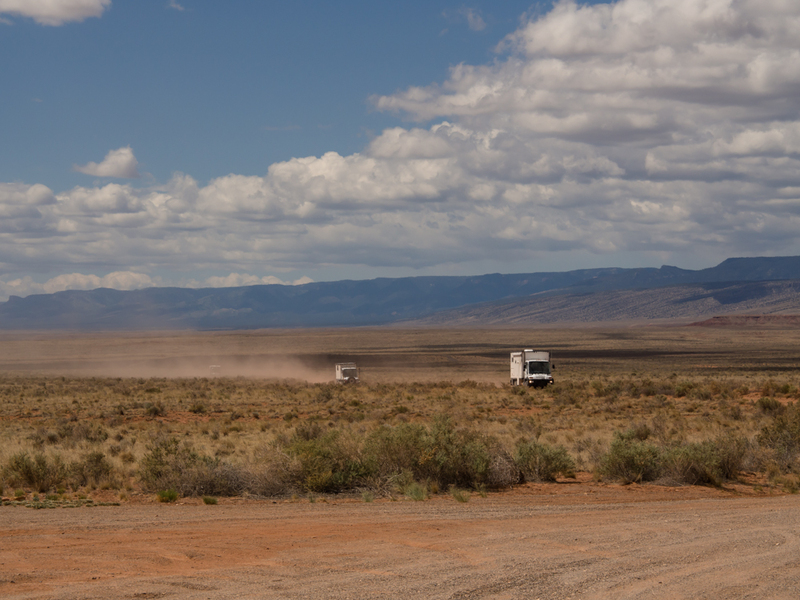 We turned north on the dirt road that leads through the Vermillion Cliffs area. 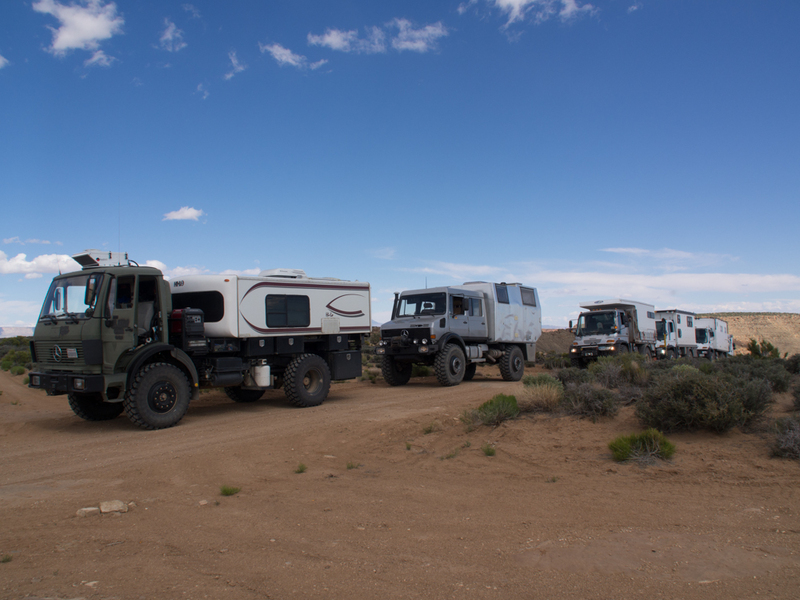 About 20 miles into the Vermillion Cliffs trail we came on a campsite and lo and behold there was another 1017. This couple, Elke and Axel, are from Germany and have "been out since 2006". 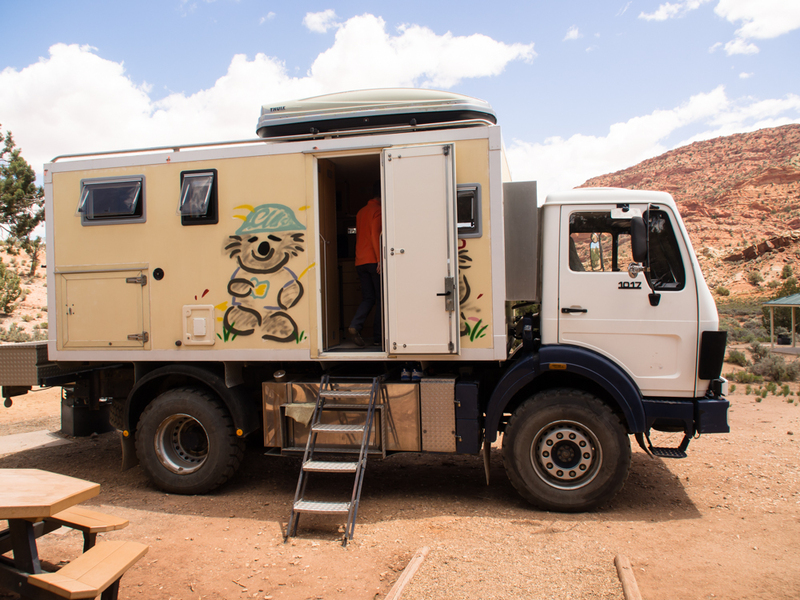 They have a very nice camper and travel with their son. 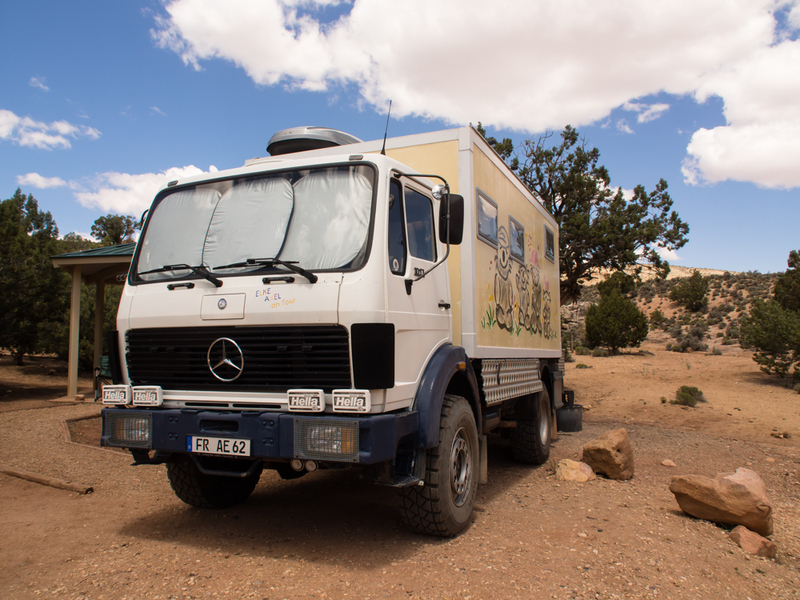 Unlike Thor, their truck is not a 4-wheel drive. 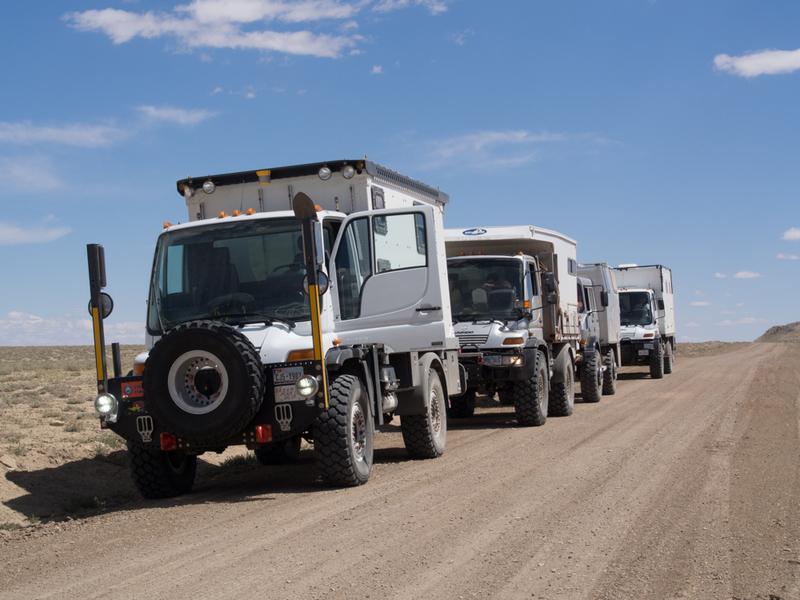 A front look at their rig. 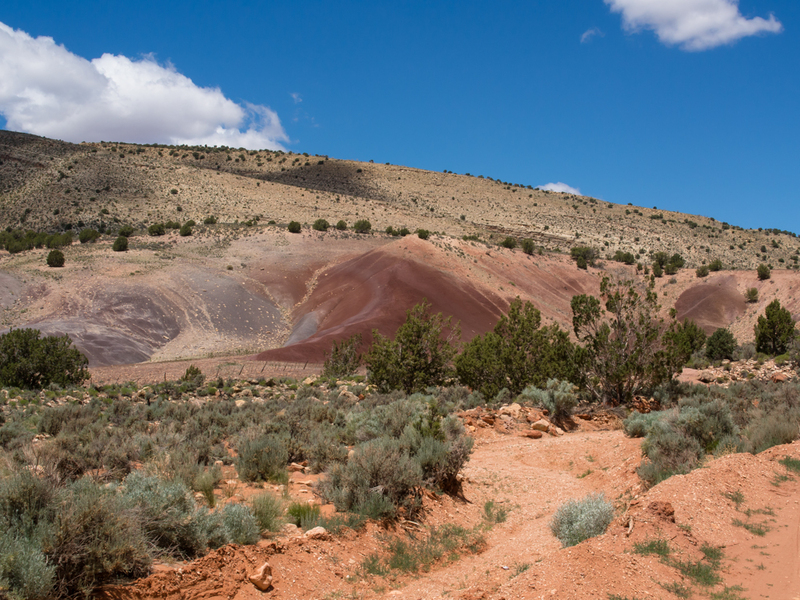 Further through the Vermillion Cliffs area, we came upon these brightly colored hills. 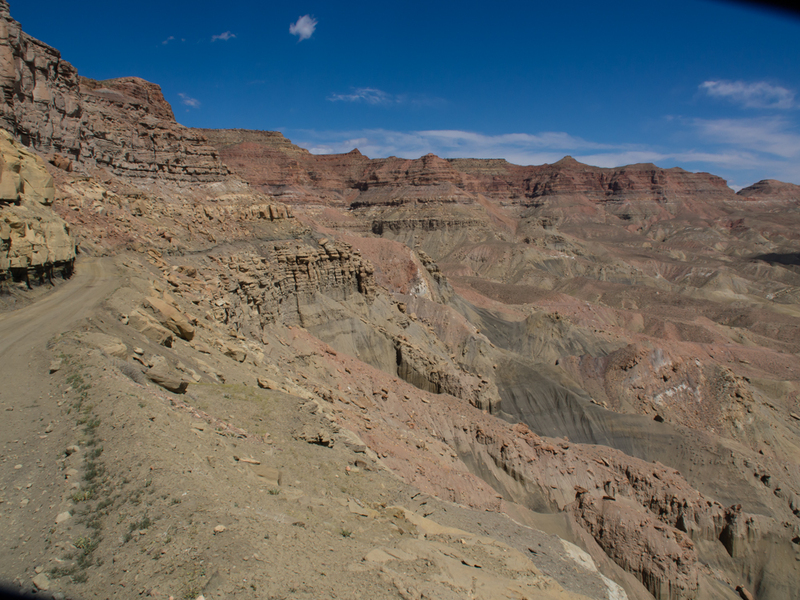 From the Vermillion Cliffs, we headed east to Big Water to meet up with Al and Claudia from San Diego in their U500. 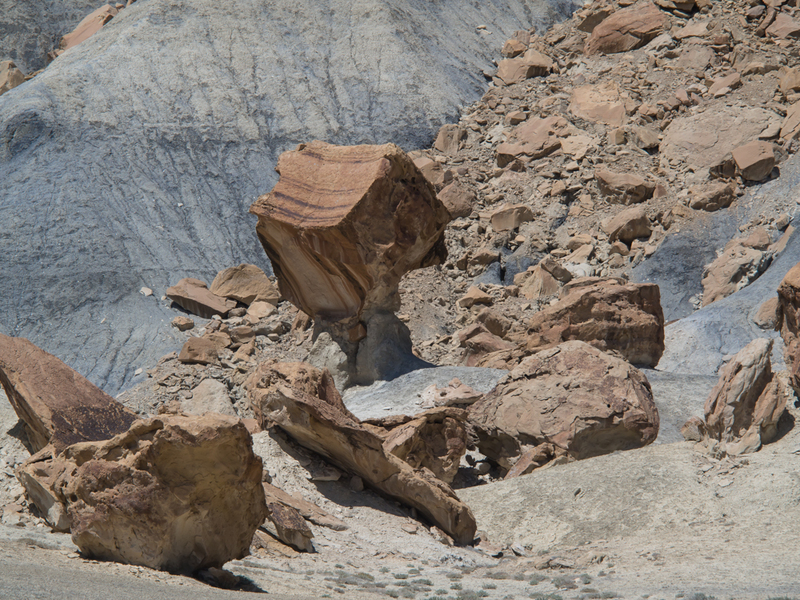 There were interesting balanced rocks at the base of some of the cliffs. 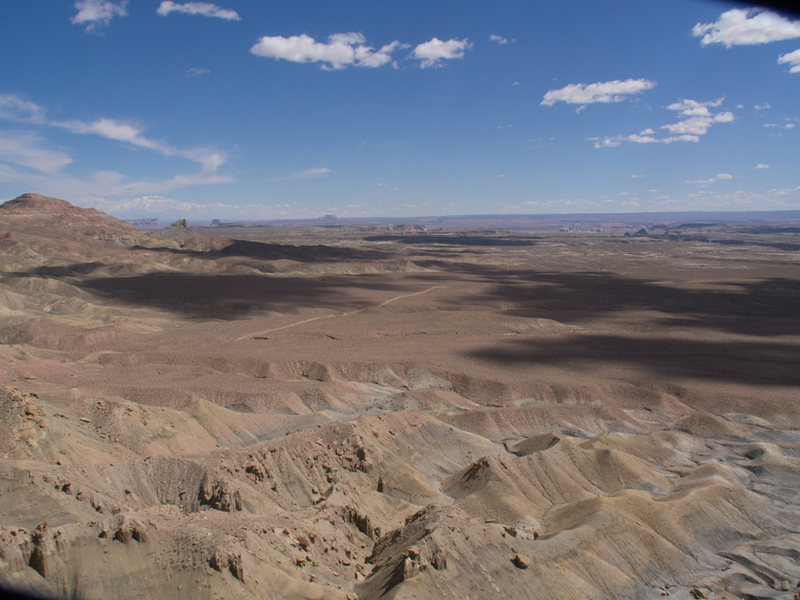 The dark layers are coal seams and the coal produced interesting shades of gray in the strata. We did a bio-stop and Vince approaches us from the south. The cliffs along Smoky Mountain road are breath-taking. 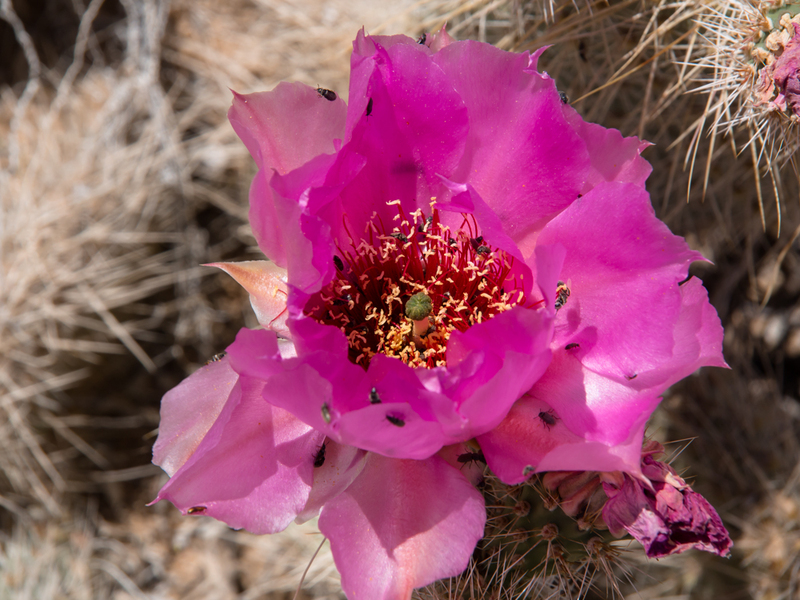 I spotted a small cactus that was in bloom and being worked over by the insects. A shot from the cab while in motion heading up the steep grade on Smoky Mountain. 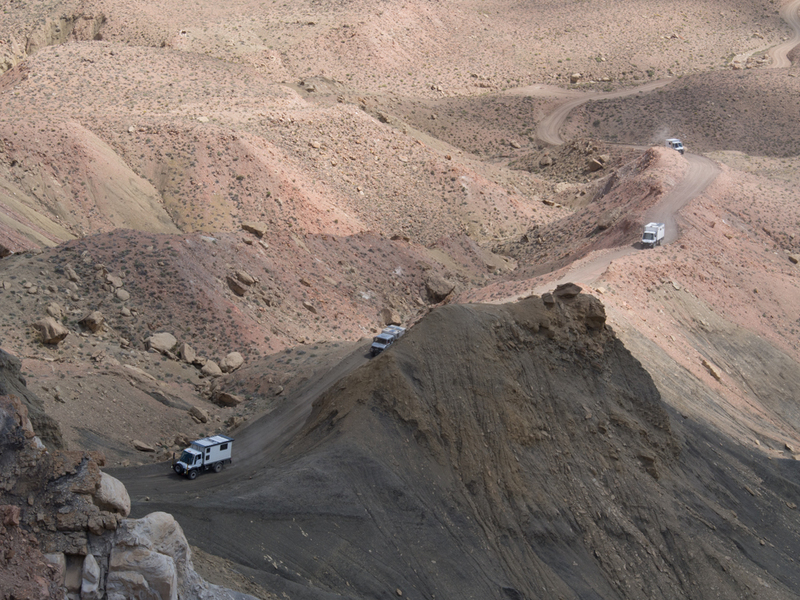 When I hit a safe point, I could see the balance of the group before they hit the steep portion of the road. 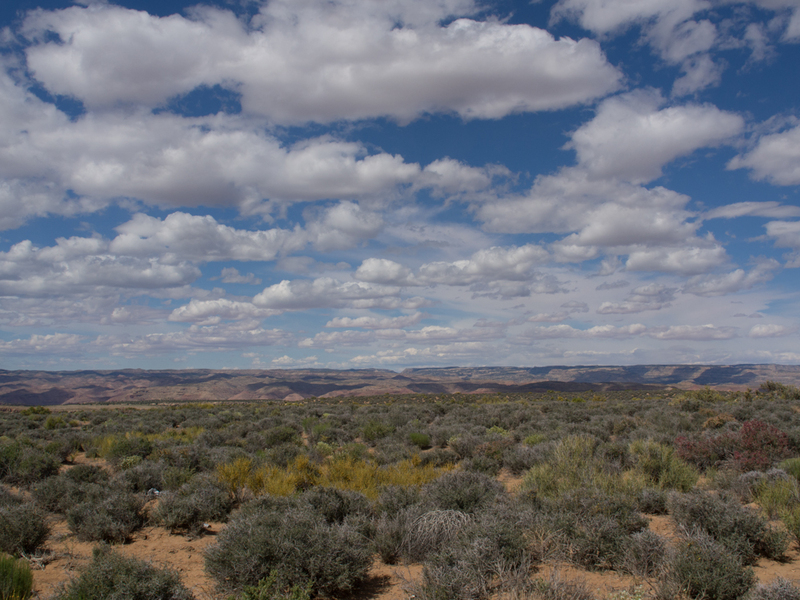 From the top of the mesa, we had a commanding view of the valley. 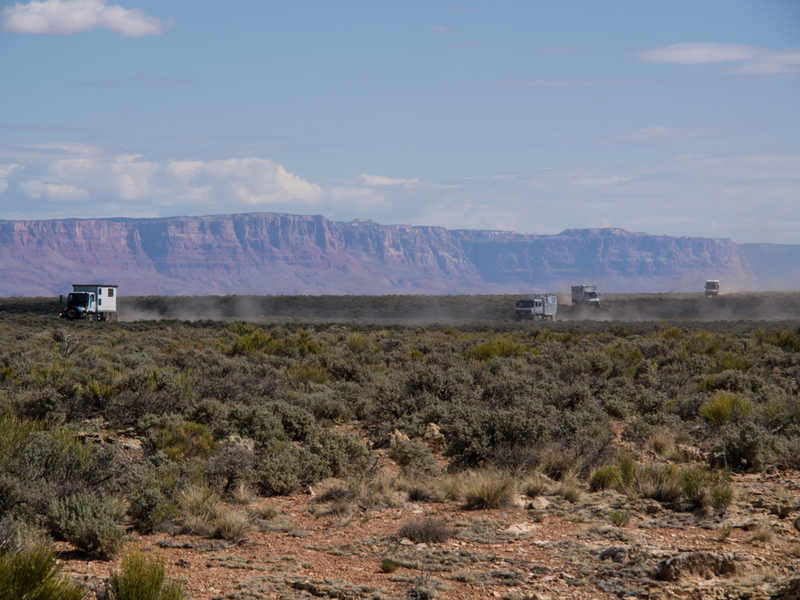 Smoky Mountain road is visible as is Lake Powell in the distance. 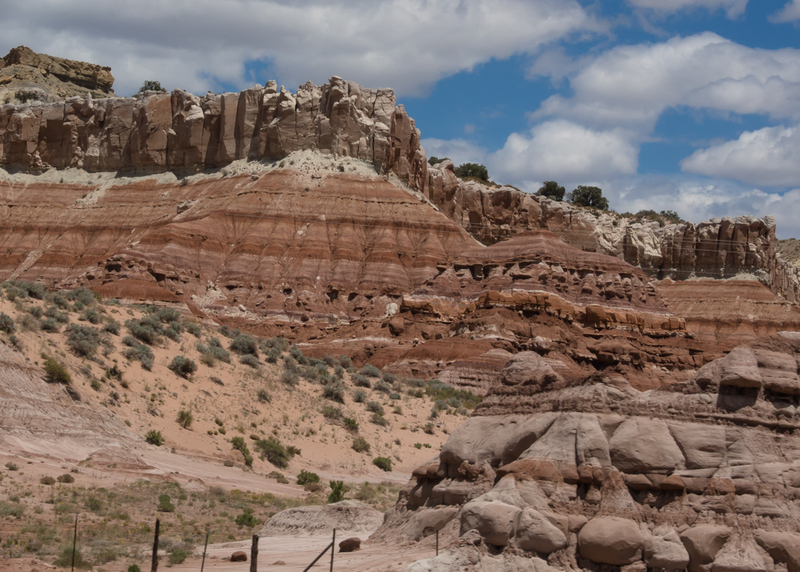 The cliffs of the mesa were very steep and intolerant of a mistake on the part of a driver. 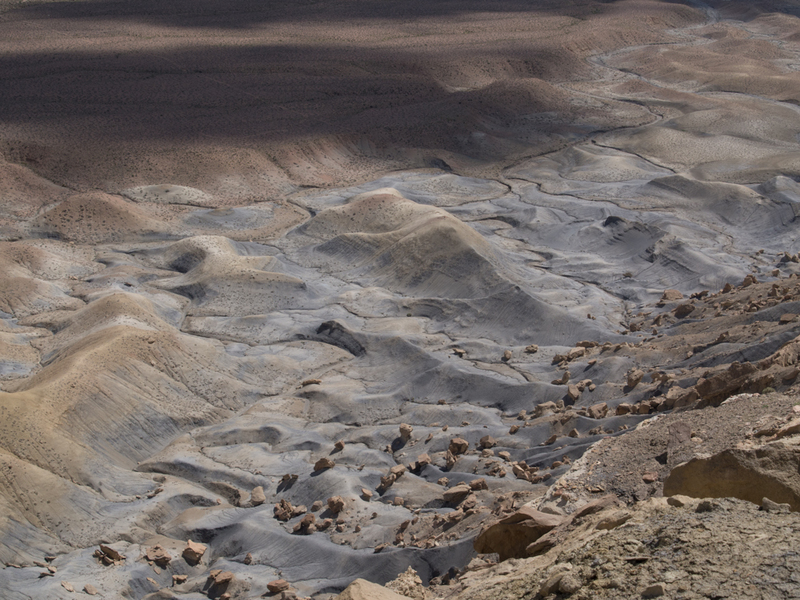 Near the first crest, a switchback allowed me to shoot a photo of the balance of the members of the group. 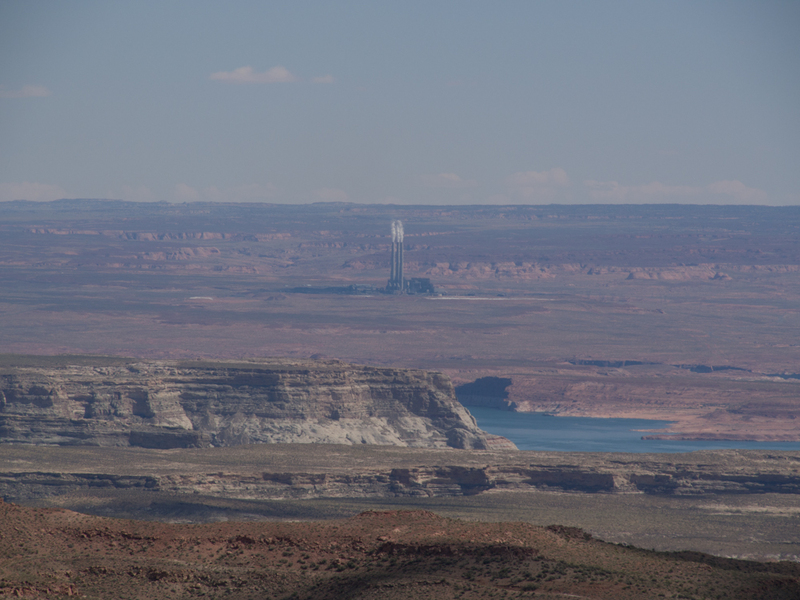 From the top of the mesa, we could see the Navajo Power plant near Page, AZ. 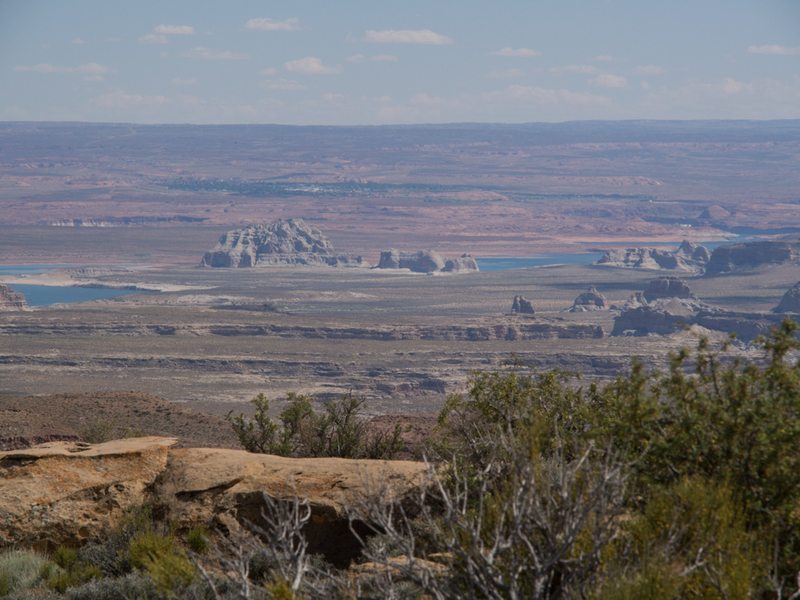 Also visible is Lake Powell. 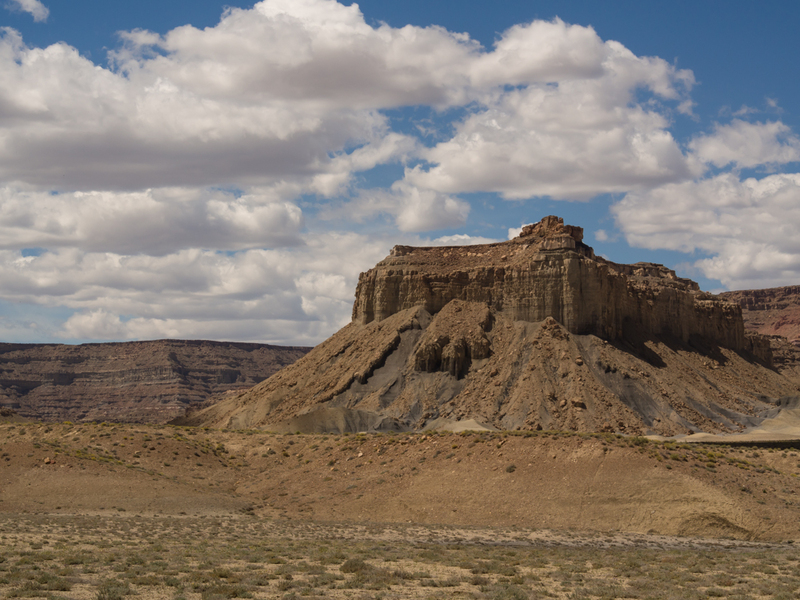 The structure in the center of the photo above is Gunsite Butte. 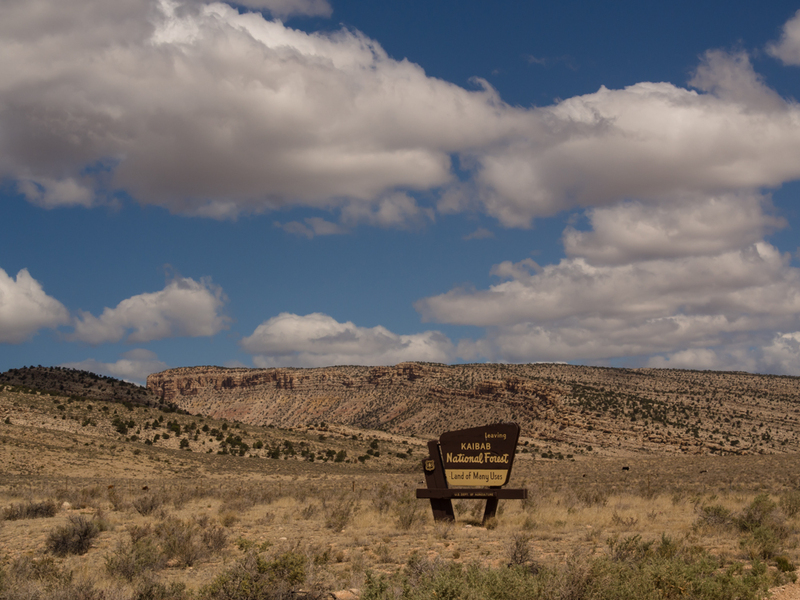 The top of the mesa had unobstructed views in every direction. 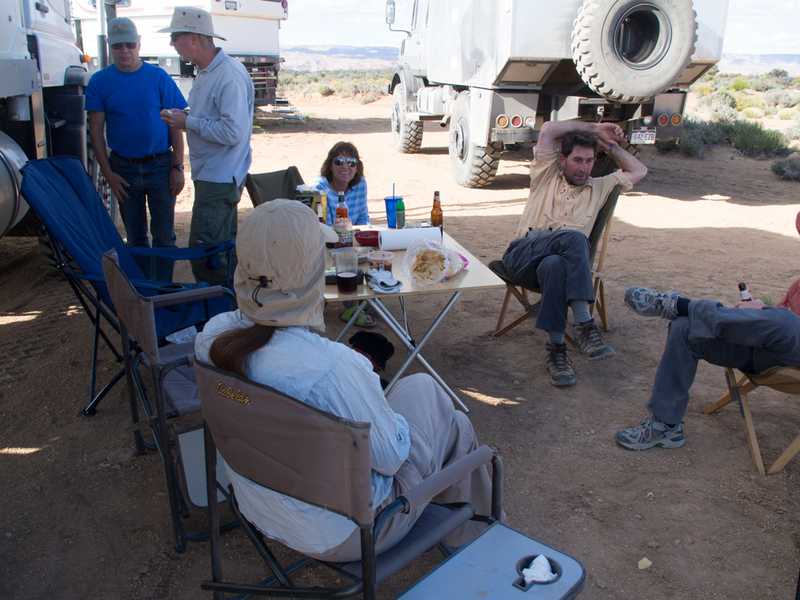 The group decides on the final camp location on the mesa. Cocktail hour begins after we set up camp. Smoky Mountain trail is quite exciting. 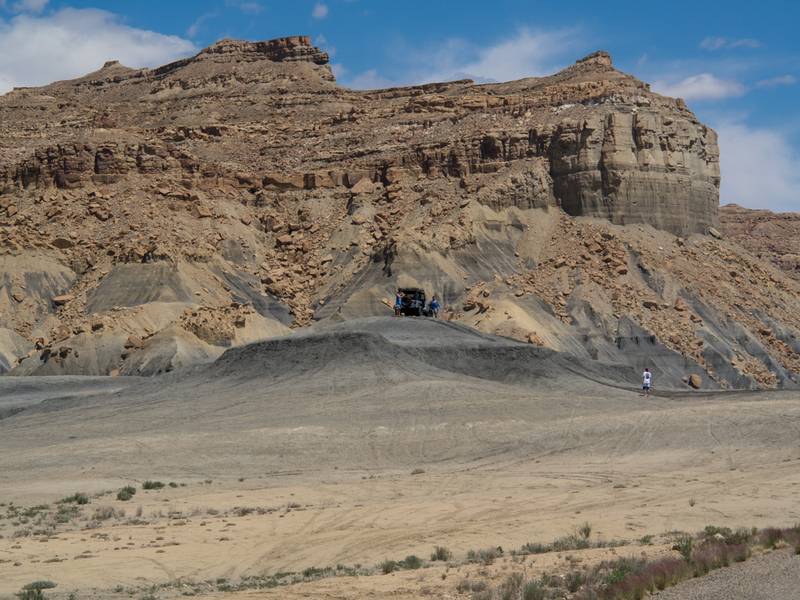 The initial grade that gets from the valley floor to the top of the mesa is a real "attention getter": narrow, steep, multi-thousand foot drop-offs and tight turns. What could be better? 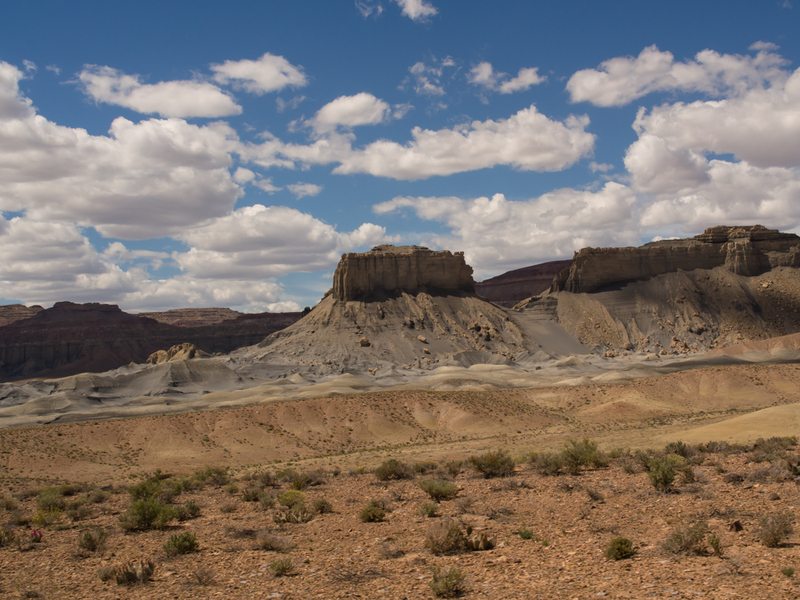 Tomorrow, we head north on Smoky Mountain and then over to Hole in the Rock via Left-Hand Collet canyon. Photos and Text Copyright Bill Caid 2013, all rights reserved. For your enjoyment only, not for commercial use.